Pres. Trump just reversed the FCC’s internet privacy rules allowing the sale of individual’s internet browsing and gives big corporations power over personal data online. 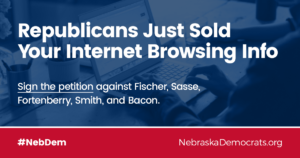 Republican Congressmen Fortenberry, Smith, and Bacon joined Republican Senators Fischer and Sasse and voted to eliminate critical internet privacy protections. Trump and the Republican Party are allowing Internet Service Providers to sell individuals’ private internet browsing data including health and financial information, without consent or knowledge. Voters all over the United States understand the importance of personal privacy especially on the internet. The Nebraska Democratic Party is gathering signatures on a petition to show Nebraska’s Members of Congress—all Republicans—that voting against our privacy rights will have consequences at the ballot box! The petition can be found on www.NebraskaDemocrats.org.